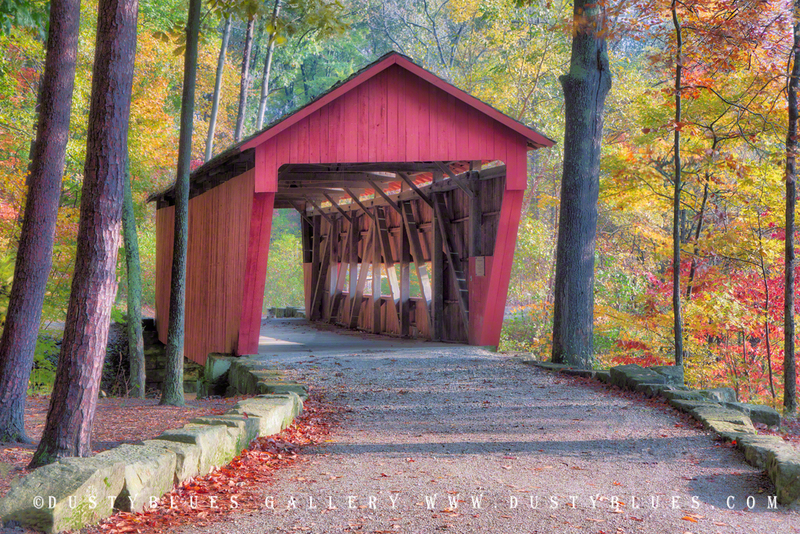 A prefect Fall morning glow at this classic covered bridge. Photo © copyright by DustyBlues LLC. An 8 x 10" custom matted 5 x 7" print. Fine art enduring archival ink print finished on premium Epson luster paper. 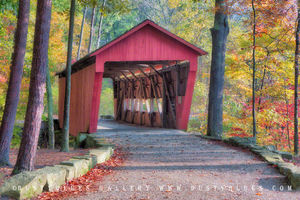 All purchased art work ships without the copyright statement © DustyBlues LLC as seen here on our web site. Fine art enduring archival ink prints, personally signed and finished on premium Epson papers. The artwork dictates the paper used but we will supply the print based on your preference. We have stock of many papers and substrates. Alternatively we can have these printed on metallic or acrylic substrates to satisfy your requirements. Just give us a call! Each art work is custom printed, matted and finished in a quality frame finished to museum quality standards and ready to hang. Dimensions shown are inside dimensions of the frame. Our elite canvas gallery wraps are stretched onto 1.75" museum quality assemblies endowing an exceptional finished appearance and a wonderful visual relief from your wall surface. This presentation provides the artwork viewer a very distinctive experience. Our water-based, environmentally guarded resin coating, seals the veneer appearance and applies ultraviolet preservation allowing generations to observe the artwork's beauty. This art work is custom printed by Dusty, double matted with colors to enhance each art work and installed in a superior quality frame custom made for each image. The print is protected by museum quality Plexiglas with UV protectant to significantly reduce fading and provide many generations of exceptional viewing pleasure. Dimensions shown are inside dimensions of the frame. This artwork is museum-quality printed by infusing the inks directly onto specially coated sheets of aluminum. Detail and resolution are impressive and have a magical radiance. To provide durability two thin sheets of aluminum are sandwiched with a solid core in the middle. This keeps your photo mounts strong and durable for exceptional longevity. Once set on the triple-reinforced base, the photo has the ideal protection against loss of shape. The low weight also lets you hang your favorite image on the wall with ease, even in a large format. The artwork on aluminum Dibond is delivered ready-to-hang, and the hanging system is included in the price. Option #1 (Mounting Posts) - Attach your print to your wall with four aluminum mounting posts. The mounting posts act as stand-offs and keep your print separated from the wall by 1". Option #2 French Cleat - With this option, your Dibond aluminum print is attached with a wooden mounting bracket on the back. Depending on the size of your selection, the thickness of the backing cleat and the chosen mounting frame your finished artwork will be offset from the wall giving it a great sense of space. Artworks come alive with stylish lines and the added depth of an acrylic print. Each artwork is printed directly onto the back of a 1/4" sheet of clear acrylic. The high gloss of the acrylic complements the rich colors of each artwork and produces stunning results. The image is the art! All acrylics are "ready to hang" and have different methods to mount the acrylic print. Option #2 French Cleat - With this option, your acrylic print is attached with a wooden mounting bracket on the back. Depending on the size of your selection, the thickness of the backing cleat and the chosen mounting frame your finished artwork will be offset from the wall giving it a great sense of space. Our elite canvas gallery wrapped Triptychs are stretched onto museum quality assemblies endowing an exceptional finished appearance and a wonderful visual relief from your wall surface. This presentation provides the artwork viewer a very distinctive experience. Each Triptych (a Panorama image divided into three separate segments) is perfectly aligned and provide that special look for a wonderful presentation on your wall. DustyBlues offers many panoramic artworks in high quality canvas gallery wrapped finishes. These may also be completed as diptychs, triptychs, or custom made to your specifications. Please contact us. DustyBlues offers licensing for most of our catalog. Pricing is based on various factors so please contact us to evaluate your needs. Thanks. All licensed art work ships without the copyright statement © DustyBlues LLC as seen here on our web site. ** International orders may incur additional shipping charges. All material © copyright by DustyBlues LLC. All rights reserved. Site by WideRange Galleries.